100 new recruits will begin a 3-year online programme of study in September 2016 and at the same time earn a salary. Members of the working group responsible for developing the new BA (Hons) in Insurance Practice Apprenticeship Programme l to r: Dr Michael Barrett IT Sligo, Susan Naughton Irish Brokers Association, Paula Hodson Insurance Institute, Michael Horan Insurance Ireland, Sandra Harvey-Graham Insurance Institute. Apprenticeship training in Ireland is set to be transformed by the introduction of a new honours degree programme aimed at preparing insurance professionals for the world of work. The Bachelor of Arts in Insurance Practice is the first professionally validated level 8 programme in Higher Education and has been designed and developed by IT Sligo in close collaboration with the Insurance Industry. The apprenticeship will allow school leavers, graduates and career changers to get a foot in the door to one of Ireland’s largest and most diverse sectors. The programme will be delivered online by IT Sligo and the Insurance Institute over three years to students who will be employed with many of the leading insurance companies and brokers in Ireland. The online study is all done from the apprentice’s workplace, making the programme suitable nationwide. As an ‘earn and learn’ apprenticeship, the programme will teach technical knowledge through a formal degree, while developing vital workplace skills on the job. The programme will begin this September, and will recruit 100 students initially. There will be potential for further growth with the addition of a Life Insurance stream next year. 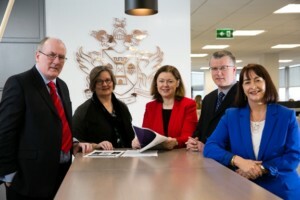 “It helps to solve the issues companies are facing with skills gaps and talent shortages, and it also provides people with a structured pathway into the profession,” says Paula Hodson, Director of Development Services at The Insurance Institute, which worked closely with IT Sligo in developing the new programme. Dr Michael Barrett, Head of Department of Business at IT Sligo, was a key member of the working group which developed the Insurance Practice Apprenticeship. “I want to pay tribute to the staff of both The Insurance Institute and IT Sligo for their tremendous work in helping to bring this game-changing apprenticeship programme to fruition in a comparatively short period of time.” he said. Companies will begin recruiting for apprentices in June. Minimum entry requirements include two honours in the Leaving Cert, including a pass in English/Irish and Maths. Further details can be found on The Insurance Institute’s website at iii.ie/apprenticeships.